The Amish funeral shares some traits in common with non-Amish funerals, while differing in others. 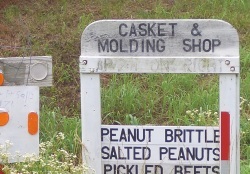 Amish attitudes towards death also vary from those typical of non-Amish society. Amish tend not to dwell on the tragic aspect of death and typically take a more stoic and reserved approach. The idea that “God willed that it be so” resonates with Amish. Most Amish typically do not subscribe to the belief in assurance of salvation, so there are typically not the assertions that a deceased individual is “in a better place” that one often hears at non-Amish funerals. The Amish more typically abide what they call a “living hope” of salvation. For children who die, however, there is a strong conviction that they are taken by God. In either case, the emphasis is on what lies beyond. Amish hope that a life well-lived will lead to salvation in heaven. Amish tend to speak frankly about death itself, which in their large communities and agricultural setting, is experienced frequently (by both humans and animals) and is simply seen as a part of life. At the same time, Amish certainly feel the pain of loss as any others do. Grieving takes place and Amish struggle with the same emotions anyone losing a loved one would have. After a death, Amish women typically wear black clothing as a visual indicator to the community that they have lost someone close to them. The length of time an Amish woman will wear a black garment will vary based on the closeness of the relationship. When an Amish person dies, in most communities the body is taken to a funeral home for embalming. Then it is returned to the home for a viewing. Family and others in the community will visit to pay their respects. The body is laid in a plain pine-casket of very simple design. In larger communities, an Amishman will operate a business making the plain caskets. Amish funerals are in most ways similar to regular church services, with attendants gathering in a home or other structure such as a shop or barn at the home place of the deceased. The deceased individual is placed in the casket, which is left open, in the center of the room, with the minister preaching just a few feet away. As in a regular Amish church service, preachers give two sermons, one lasting approximately 20 minutes and the other around an hour. There may or may not be singing at the standard times of a church service, that is the beginning and the end. At the end of the service, attendants file past the open casket for a final look at the body, while the preacher recites the individual’s name and a prayer. Parents may lift up children to get a closer look at the deceased. The casket is closed and carried out for its journey to the cemetery. After the church service, those not attending the actual burial may eat a meal with other attendants. As there may be 300, 500, or even more attendees at a funeral, food may be served cafeteria-style, rather than in individual seatings as is done at the lighter-attended church gatherings. Attendees typically visit and share as they would after any church service. Amish may view the funeral or viewing as a social occasion as well as a time for mourning. One older attendee expressed how he was looking forward to the event. Contrary to what one might expect at a funeral, Amish may share laughter and exchange social visits before and after the service. Yet the general tone of the funeral itself is solemn as with funerals in other cultures. The casket may be loaded onto a specially designed hearse wagon for its final journey. In some cases, if the cemetery where the deceased is to be buried is located far away, it may be transported by car. Otherwise, Amish will follow behind in their buggies until they reach the cemetery itself. 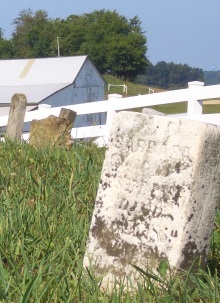 In the Swiss Amish tradition, gravestones are made of wood and are unmarked. The wood material means they wear away over time, emphasizing the transient nature of life. The lack of a full name on the marker de-emphasizes the importance of the individual in relation to community. A special book, sometimes printed along with the Amish church directory, serves as a guide to locate an individual’s resting place. Death and the funeral mark the end of a Christian life. Amish recall that individuals are sinners and at the mercy of God. Amish abide a living hope that individuals are with God in heaven, though typically don’t assert to know a soul’s final place of existence. In the large and extensive Amish community, death happens frequently, another factor that contributes to the more matter-of-fact Amish approach to dying. 11 responses to What is an Amish funeral like? I wasn’t aware of so many different details of the Amish Funerals. Very informative and interesting. Also, my deepest sad feelings go out to the Amish family and to the Yoders in losing their niece in the buggy accident in Kentucky. So inocently taken and so fast. Could you recommend additional non-fiction resources about the Amish beliefs. I am doing a paper on the Amish and the Mennonites and the beliefs and customs. Another car/buggy accident took a 17 year old Amish boys life 7-21-13 in Pawnee City Nebraska. His sister, who was also in the accident, is in bad shape and the next 24-48 hrs will tell what happens with her. I plan to go to one of the wakes they have planned for the boy and wondered what to expect. I heard of some Old Order Mennonites that did not embalm but rather kept the body on ice, and had wondered if that might be the case here as well. Are you ready to meet your maker? How often to you ask your soul that question? I had a mortality reality check last week. The youngest son of my Amish church district’s Bishop went for a swim with 14 of his life long friends last Thursday evening. That 21 year old, engaged to be married, young man did not make it out of that pond alive. He started struggling, called for help and nearly took his rescuers life with him in his panic to live. Only the one man drowned, because a third saved the second. The theme of conversation at the viewing was ‘Are you ready to meet your maker, today?’. Certainly that young man did not plan what happened, but it did happen, and he is buried now. Life is fleeting and fragile. We live each day by God’s Grace. For anyone, God can choose this to be your day. Thanks for this comment Lance. Lot to think about in there. Well, really just one, important, thing. I’m sorry for the family and loved ones. I’ve just recently discovered your web site and find it a most informative source. I’m enjoying your work here a great deal! I was wondering if Amish children and men also adopt some sort of visual indicator as women do (ex: black arm bands, special hats etc…). If so, what are they and how long are they normally worn. If not, why do Amish women wear indicators of mourning but not Amish men (and/or children)? Thanks, again, Erik, for your fascinating and very informative site. Greg, good question and thanks for the comments. I’m not aware of any clothing changes that men etc. undertake when in mourning (arm bands, hats etc) though with the diversity across Amish communities I am always ready to be surprised. And why would only women wear dark clothing? There may be a deeper sociological or anthropological explanation that I am not able to offer. I haven’t investigated but in general, I wonder do we more often see women wearing mourning clothing than men in other cultures as well? I’ve never heard of any special symbols of mourning for men, but like Erik said, it seems there are other cultures where the women are more apt to”dress in mourning.” In our community, men wear white shirts with dark suits and white shirts to funerals, but we do to church & weddings also. For viewings we often wear a dark suit with a light blue shirt or white shirt. free online grant applications so I have been looking around for the finest site to get one. My Amish ancestor’s are all buried side by side except a great grandmother who remarried after her husband died. She is buried beside her second husband. Leave a reply to What is an Amish funeral like?